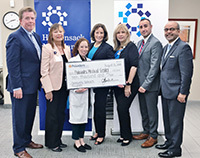 The Provident Bank Foundation recently made a generous gift to the Hackensack Meridian Health Palisades Medical Center Foundation that will help improve the health and wellness of residents with limited access to care throughout Hudson and southern Bergen Counties. Jane Kurek, Executive Director of The Provident Bank Foundation, along with David Ostrowski and Jorge Tutiven of Provident Bank, visited Palisades Medical Center to present The Provident Bank Foundation Major $10,000 Grant to support the hospital's Community Outreach Program. The program addresses the healthcare challenges of individuals in Hudson and Bergen Counties with special emphasis on HgA1c diabetes screening and education. Over the course of the grant, the Community Outreach Program will provide diabetes screenings for 1,400 individuals at healthcare screening events throughout our area. Click here to read more about the Provident Bank Foundation Donation. It was a festive night of celebrity guests, great food, music and dancing at Son Cubano Restaurant and Bar as hundreds of our supporters united to raise funds to support Tackle Kids Cancer. 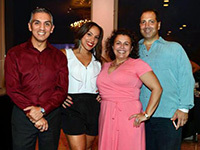 The Summer Samba Night fundraiser was made possible thanks to the generous support of Son Cubano owner, Alex Duran. Hosts for the event included Cara and Luis Robles, NY Red Bulls Goalkeeper, and Jennifer and Dr. Michael Farber, Team Physician for the Brooklyn Nets, New Jersey Devils and New York Red Bulls. MSG Network personality Bill Pidto served as Master of Ceremonies, and the Title Sponsor was Audi. To support Tackle Kids Cancer, please call (844) 775-KIDS  or visit tacklekidscancer.org. Click here to see more photos from the Summer Samba Night. 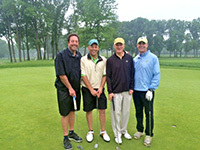 On May 21, golfers hit the links at Ridgewood Country Club in Paramus during the 28th Annual Palisades Classic Golf Tournament. During the Palisades Classic, golfers hit the links, tennis players put their racket skills to the test, and dozens more came to enjoy the evening reception. "We are extremely grateful to all of the individuals and organizations that helped make this year's Palisades Classic an overwhelming success," said Anthony J. Passannante Jr., M.D., FACC, President of Hackensack Meridian Health Palisades Medical Center. "Their generous philanthropic support will help us ensure that we always provide our patients with the highest quality care." Click here to see more photos from the 28th Annual Palisades Classic. "Our volunteers play a vital role in helping Hackensack Meridian Health Palisades Medical Center provide high quality care for our community,"”" said Joseph Burt, VP/Executive Director of the Hackensack Meridian Health Palisades Medical Center Foundation. "They truly exemplify what it means to make a strong commitment to caring for our neighbors each and every day." During the Volunteer Recognition Luncheon, Mr. Burt and other Hackensack Meridian Health Palisades Medical Center team members gave special awards and recognition to local residents to recognize their cumulative hours of volunteer service. More than 200 volunteers offer their time and energy in almost every department of Hackensack Meridian Health Palisades Medical Center. Volunteer activities at Hackensack Meridian Health Palisades Medical Center include assisting the nursing staff and patients, working in the Gift Shop, performing clerical duties, and organizing special fundraising events. For more information or to volunteer, please call Denise Whitley, Coordinator of Volunteer Services, at (201) 854-5011. Click here to see more photos from the 2018 Volunteer Recognition Luncheon. 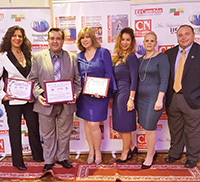 Hackensack Meridian Health Palisades Medical Center received high honors from CAMBIO Publications Group during its 2017 Miss Hispanidad USA Pageant and Hispanic Awards Gala. Palisades Medical Center earned El CAMBIO's prestigious "Hospital of The Year" award for its "exceptional performance and growth" and for outstanding community leadership. Nikki Mederos, Director of External Affairs at Palisades Medical Center, was also honored as the 2017 Cuban Woman of the Year for her commitment and dedication to serving our local communities. Click here to see more photos from the Hispanic Awards Gala. Hackensack Meridian Health Palisades Medical Center posthumously honored Thomas M. Venino, Sr., Esq., during a special Wall Of Honor dedication ceremony in the hospital's Main Lobby. Members of the Venino Family, Board members and team members all gathered together to pay tribute to Mr. Venino, who was a well-loved and respected member of our Palisades family. On September 10, 1978, Mr. Venino and a group of committed volunteers from the North Hudson-South Bergen community helped fulfill a longstanding dream. What had once been North Hudson Hospital was relocated to a new home on the North Bergen waterfront — the site of the new Palisades Medical Center. Mr. Venino and the other founders did everything that needed to be done to ensure that the hospital's doors were open to serve our community. He was instrumental in galvanizing public support, purchasing the land and providing input on needed services and programs. In the decades to follow, Tom and his late wife, Joan, served in many volunteer leadership roles for Palisades Medical Center and the Foundation — Tom as a member of the Board of Governors, serving as Chairman from 1978-81, and Joan as an officer and dedicated member of the Hospital Auxiliary. The Venino family's dedicated service continues as son Thomas M. Venino, Jr., Esq., is a current member of the hospital's Board of Governors. For his extraordinary efforts in advancing the mission of Palisades Medical Center and his many contributions to foster exceptional medical care for all members of the community, Mr. Venino will now be perpetually memorialized as a member of the Wall Of Honor. Click here to see more photos from the Wall Of Honor Dedication Ceremony. On August 10, more than 300 guests enjoyed a festive night of great food, music and dancing at Son Cubano Restaurant and Bar to help raise funds to support Tackle Kids Cancer, which provides support for the Children's Cancer Institute at Hackensack Meridian Health Hackensack University Medical Center. The Summer Samba Night fundraiser was made possible thanks to the generous support of Son Cubano owner, Alex Duran. Hosts for the event included Cara and Luis Robles, NY Red Bulls Goalkeeper and Jennifer and Dr. Michael Farber. "We are extremely fortunate to be surrounded by residents, businesses and community leaders who truly care about providing children access to the highest level of cancer care, and, ultimately, finding a cure for pediatric cancer," said Jon M. Fitzgerald, Foundation president and chief development officer of Hackensack Meridian Health. For more information, or to support Tackle Kids Cancer, please call (844) 775-KIDS  or visit tacklekidscancer.org. Hundreds of Hackensack Meridian Health Palisades Medical Center team members, medical staff, and volunteers lined the hallways leading to a jam-packed main lobby to give Bruce J. Markowitz a special farewell salute. Bruce ended 24 years of dedicated service as President and CEO on June 29. The Board of Trustees established a "Wall of Honor" in the lobby and unveiled a plaque dedicated to Bruce in recognition of his commitment to patients. 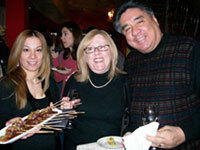 An evening reception was also held at Son Cubano in West New York. 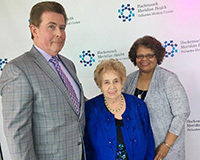 The Hackensack Meridian Health Palisades Medical Center Foundation established the Bruce and Eileen Markowitz Fund to Enhance Patient Care in gratitude for contributions made in honor of Bruce. Click here to see more photos from the Farewell To Bruce. Click here to donate to the Bruce and Eileen Markowitz Fund. Hackensack Meridian Health Palisades Medical Center recently presented a special community partnership recognition to representatives from St. Joseph of the Palisades Church in West New York. Palisades Medical Center and St. Joseph of the Palisades Church work together throughout the year to conduct family health fairs and health screenings for local residents. We thank our friends at St. Joseph of the Palisades Church for their longstanding partnership with Palisades Medical Center and their tireless commitment to improving the health and well-being of our neighbors. 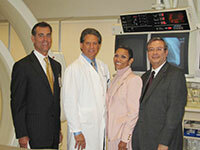 Pictured left-to-right are Nikki Mederos, Director of External Affairs at Palisades Medical Center; Rev. Eliott Cruz, Director of Pastoral Care at Palisades Medical Center; Rev. Nelson Oyola; Peggy Schiebel; Rev. Msgr. Gregory Studerus; Rev. Suleima Rosario-Diaz, Coordinator of Faith-Based Initiatives at Palisades Medical Center; Rev. Ernesto Tibay; Millie Benitez; Rev. Cesar Infante; Pam Doiron and Debbie Viola. 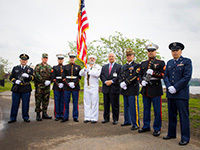 A special Memorial Day Ceremony was held on the waterfront campus of Hackensack Meridian Health Palisades Medical Center, honoring our military heroes. Hospital team members, medical staff, volunteers and Harborage residents participated in the touching ceremony to remember all who have given the ultimate sacrifice in the name of our great country. As part of the ceremony, military personnel presented Anthony Passannante, M.D., vice president, Medical Affairs and chief medical officer, Palisades Medical Center, with a United States flag that was flown over Camp Victory amid the battlefields of Iraqi Freedom Operations against the enemy in Baghdad Province, Iraq. Click here to see more photos from the 2017 Memorial Day Ceremony. Hackensack Meridian Health Palisades Medical Center has awarded $32,000 in Community Service Merit Scholarships to 16 local students from eight local high schools in the hospital's primary service area. The students and their families joined local community leaders and hospitals executives for a special dinner celebration at Son Cubano in West New York. The Hackensack Meridian Health Palisades Medical Center Community Service Merit Scholarship Program recognizes and rewards high school seniors who have demonstrated significant accomplishments in community service while maintaining academic success. Two graduating seniors (Class of 2017) from each of the participating high schools were selected to each receive a merit scholarship in the amount of $2,000. Click here for a list of winners. "We are delighted to provide scholarship support to these amazing young men and women who have all shown a tremendous commitment to the importance of civic engagement and giving back to our local communities," said Bruce J. Markowitz, President of Hackensack Meridian Health Palisades Medical Center. "We know that paying for college can be challenging and we hope that this Community Service Merit Scholarship will help lessen the burden for the deserving recipients." The online application process was conducted in February and March. Recommendations were made by high school guidance counselors and scholarship applications were reviewed by a committee of community volunteers. Click here to see more photos from the 2017 Scholarship Dinner. On May 19, Hackensack Meridian Health Palisades Medical Center held its 2017 Employee Recognition Dinner at the Chart House in Weehawken. The celebration recognized all of Palisades Medical Center's Service Award Honorees and the 2017 Employee of The Year — Delia Colon, Patient Registrar! Thank you for your years of service and dedication to our patients and their families. Click here to see more photos from the 2017 Employee Recognition Dinner. In honor of what would have been Yogi's 92nd birthday on May 12, the Yogi Berra Museum & Learning Center donated a selection of Yogi Berra Museum baby hats, along with free Museum memberships, for the families of all children born on May 12 at Hackensack Meridian Health Hospitals. The outreach effort is part of the Museum's mission to keep Yogi's remarkable legacy alive for a new generation of learners and leaders, both on and off the field. "While Yogi is sadly no longer with us, the values that made him a national treasure – respect, sportsmanship, perseverance and excellence – are more important today than ever," says Eve Schaenen, executive director, Yogi Berra Museum. "Yogi's entire life represents a shining example of integrity, humility and unwavering kindness. With this gift, we hope to see a whole new generation sporting Yogi Berra Museum hats in his honor." In recognition of National Volunteer Week, the PMC Foundation hosted an awards luncheon honoring those who give of their time in the service of others. Volunteers were recognized for achieving milestones in hours served. Beatriz Garcia, a volunteer for 23 years, reached 17,000 hours of service. Bea was presented with a special recognition from the office of President Barack Obama. She has also been named one of five finalists for the NJ Biz Healthcare Heroes awards in the volunteer category. "I enjoy helping people in my community, so I enjoy meeting so many different people while volunteering in the Gift Shop and organizing fundraising activities for the hospital," said Garcia. "I feel a great sense of pride when employees and doctors thank me and the other volunteers for the work that we do every day." Click here to see more photos from the 2017 Volunteer Recognition Luncheon. Each year, a group of dedicated team members provide the leadership for an employee giving campaign. Gifts are designated for a Medical Center initiative that will enhance patient services. 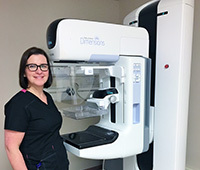 Recently, a new mammography unit was installed in our Radiology Department thanks in part to the generosity of our employees. The new system provides 3D mammography, a revolutionary new screening and diagnostic tool designed for early breast cancer detection. It provides greater visibility for the radiologist to see breast detail in a way never before possible. Ultimately, the new system will keep women from getting unnecessary biopsies or additional testing because now radiologists can see breast tissue more clearly. On September 12, hundreds gathered at Son Cubano in West New York to celebrate the 25th Anniversary of The Harborage nursing home and rehabilitation center and to honor Ed Davis, Harborage Administrator, for his outstanding service and dedication to Harborage residents and families for the past 25 years. Since opening its doors in 1991, The Harborage at HackensackUMC Palisades in North Bergen, NJ, has been recognized for stellar ratings, dedicated service and the highest quality of comprehensive, compassionate patient care. It has consistently been place in the top tier of nursing homes nationwide as acknowledged by U.S. News and World Report. "Ed Davis has been instrumental in creating a culture of patient centered care, respectful of the needs of families and their loved ones," said Bruce J. Markowitz, President and CEO of HackensackUMC Palisades. "Ed will be retiring at the end of this month. He has been outstanding in leading the operation of The Harborage, but will be best remembered for his personal, kindhearted nature and the bonds he has formed with patients and their families." Presenting sponsors for The Harborage 25th Anniversary Celebration included Son Cubano (Alex Duran and Eddie Duran), NY Waterway (Arthur Imperatore), John C. Meditz and Ed Davis. Click here to see more photos from the Harborage 25th Anniversary Celebration. On Sunday, April 24, Bruce J. Markowitz, President and CEO of HackensackUMC Palisades, proudly served as the Co-Chair of the Hudson County March for Babies fundraiser to support the March of Dimes. More than 1,000 people attended the March for Babies walk at Liberty State Park to help raise awareness and important funding to provide for babies who are born premature or with birth defects. Each year, more than half a million babies are born too soon or with a birth defect. Preterm birth is the leading cause of newborn deaths, and a leading cause of blindness, hearing loss, cerebral palsy, and learning disabilities. For more than 75 years, moms and babies have benefited from March of Dimes research, education, vaccines, and breakthroughs. Click here to see more photos from the March Of Dimes Fundraiser. HackensackUMC Palisades (formerly HackensackUMC Palisades) celebrated National Volunteer Week by holding a special luncheon at The Waterside in North Bergen to recognize its dedicated volunteers for their tireless efforts. "Our volunteers play a vital role in helping HackensackUMC Palisades provide high quality care for our community," said Bruce J. Markowitz, President and CEO of HackensackUMC Palisades. "They truly exemplify what it means to make a strong commitment to caring for our neighbors each and every day." During the Volunteer Recognition Luncheon, Mr. Markowitz and other HackensackUMC Palisades staff gave special awards and recognition to local residents to recognize their cumulative hours of volunteer service at HackensackUMC Palisades. Click here to see more photos from the 2016 Volunteer Recognition Luncheon. On November 21, the HackensackUMC Palisades Foundation presented its prestigious Star Stream Awards to New Jersey Assembly Speaker Vincent Prieto and Jeffrey M. Raskin, MD, HackensackUMC Palisades Medical Staff President, for their tireless work in supporting the health and well-being of residents throughout Hudson and southern Bergen Counties. 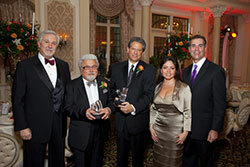 The awards were presented during the HackensackUMC Palisades Foundation's 2015 Star Stream Ball, which was attended by more than 380 business leaders, public officials and local residents. The black-tie fundraising gala was held at Rockleigh Country Club in Rockleigh, NJ, and it surpassed all of the HackensackUMC Palisades Foundation's previous fundraising records. "We are delighted that so many of our friends and supporters came together to recognize Speaker Prieto and Dr. Raskin, for their years of extraordinary service and support for HackensackUMC Palisades and our community," said Bruce J. Markowitz, President and CEO of HackensackUMC Palisades. "Vinnie and Jeff have each played a vital role in helping Palisades continue to grow and evolve to meet the changing healthcare needs of our communities." Top sponsors for the 2015 Star Stream Ball included the HackensackUMC Palisades Medical Staff; Gastroenterology Medical Associates, P.A. ; Brach Eichler, LLC; McCarter & English; Riverside Medical Group; Hackensack University Health Network; Horizon/Kenetics; and John C. Meditz. "We are extremely fortunate to be surrounded by residents, businesses and community leaders who truly care about Palisades and support our efforts to provide high-quality care for our neighbors," said Markowitz. "The success of this year's Star Stream Ball underscores Palisades' strong connection to the communities and residents that we serve." Click here to see more photos from the 2015 Star Stream Ball. HackensackUMC Palisades Foundation supporters enjoyed a fantastic night for a good cause during a special Wine Tasting at the Waterside Restaurant in North Bergen. Cork Wines and Spirits Co-founders Mike Garcia and Debbie Kemp spearheaded the event in which attendees enjoyed sampling from 100 select imported and domestic wines. Click here to see more photos from the Wine Tasting. 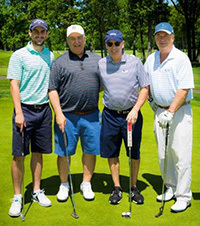 On May 18, golfers hit the links at Ridgewood Country Club in Paramus during the 25th Annual Palisades Classic Golf Tournament. Proceeds from the event will support the development of a Pediatric Care Unit within the Emergency Department at HackensackUMC Palisades. During the Palisades Classic, golfers hit the links, tennis players put their racket skills to the test, and dozens more came to enjoy the evening reception. Sodexo, Inc. and Hackensack University Medical Center were the Presenting Sponsors for the Palisades Classic. 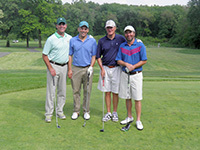 Masters Sponsors for the event included McCarter & English, Structure Tone and HackensackUMC Palisades's Medical Staff. "We are extremely grateful to all of the individuals and organizations that helped make this year's Palisades Classic an overwhelming success," said Bruce J. Markowitz, President and CEO of HackensackUMC Palisades. "Their generous philanthropic support will help us develop our much-needed pediatric unit within in our emergency department to ensure that we always provide our young patients with the highest quality care in a kid-friendly environment." Click here to see more photos from the 25th Annual Palisades Classic. HackensackUMC Palisades celebrated National Volunteer Week by holding a special luncheon at The Waterside in North Bergen to recognize its dedicated volunteers for their tireless efforts. During the Volunteer Recognition Luncheon, Mr. Markowitz and other HackensackUMC Palisades staff gave special awards and recognition to four local women who have amassed a cumulative total of more than 70 years of volunteer service at HackensackUMC Palisades. Click here to see more photos from the 2015 Volunteer Recognition Luncheon. On November 22, 2014, hundreds of the HackensackUMC Palisades Foundation's supporters packed the beautiful Pleasantdale Chateau West Orange for the 2014 Star Stream Ball. The black tie gala generated more than $440,000 to support the HackensackUMC Palisades Foundation. Star Stream Awards were presented to Fred A. Daibes, Founder & Chairman of Daibes Enterprises and Chairman of Mariners Bancorp; and Theresa de León, Senior Vice President, PNC Wealth Management and Chairwoman of the HackensackUMC Palisades Board of Governors. Click here to see more photos from the 2014 Star Stream Ball. On August 21, 2014, the HackensackUMC Palisades Auxiliary volunteers held their 8th Annual Casino Night fundraiser to support the HackensackUMC Palisades Foundation. The event was held at The Waterside Restaurant in North Bergen and was sponsored by Benzel Busch, Audi Meadowlands, PNC Wealth Management, MTM Resources, NY Waterway and The Waterside Restaurant. 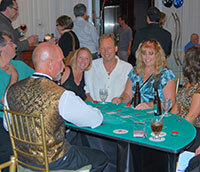 Guests enjoyed playing Blackjack, Texas Hold 'Em, Poker, Craps and Roulette. Click here to see more photos from the 8th Annual Casino Night. In recognition of his outstanding generosity to HackensackUMC Palisades, the main lobby has been named in honor of John C. Meditz. Meditz, of Weehawken, is widely recognized as the driving force that helped establish the HackensackUMC Palisades Foundation in 1999. "Like other philanthropists, John plays a key role in supporting several worthy organizations through his tireless volunteer efforts and generous donations. But at his core, John is a true visionary and leader that has put these intangibles to work in creating a brighter future for HackensackUMC Palisades and our local community," said Bruce J. Markowitz, President and CEO of HackensackUMC Palisades. Meditz is also committed to serving his community of Weehawken, N.J., where he has been a lifelong resident. He has been chairman of the Weehawken Planning Board for more than 30 years and treasurer of the Weehawken Library. He currently serves on the Boards of Xavier High School and Fairfield University and has been recognized by both as a dedicated alumnus. "John is humble about his gift giving, so we had to surprise him with this honor," said Joseph Burt, Executive Director of the HackensackUMC Palisades Foundation. "He gets greater satisfaction in seeing how his contributions help our patients and hopes that his generosity inspires others to give." The HackensackUMC Palisades Foundation's 24th Annual Palisades Classic was its most successful ever. The event, which was held on May 19, 2014, at the historic Ridgewood Country Club, generated more than $400,000 to support programs and services at HackensackUMC Palisades. More than 180 golfers hit the links and enjoyed the dinner reception. Sodexo was the Presenting Sponsor for the Classic. Other leading sponsors for the event included Structure Tone and Hackensack University Medical Center. Click here to see more photos from the 24th Annual Palisades Classic. On April 10, HackensackUMC Palisades celebrated National Volunteer Week by holding its annual Volunteer Recognition Luncheon at The Waterside in North Bergen. Our volunteers play a vital role in helping HackensackUMC Palisades provide high quality care for our community and they truly exemplify what it means to make a strong commitment to caring for our neighbors each and every day. More than 100 volunteers generously offer their time and energy in almost every department of the Medical Center. HackensackUMC Palisades volunteer activities include assisting the nursing staff and patients, performing clerical duties, and organizing special fundraising events. Volunteer positions offer flexible hours including nights and weekends. To volunteer, please call Denise Whitley, Coordinator of Volunteer Services, at 201-854-5011. Click here to see more photos from the 2014 Volunteer Recognition Luncheon. On January 15, "Miracle on the Hudson" passenger Dave Sanderson returned to HackensackUMC Palisades to thank the physicians, nurses and staff who helped care for Dave following the emergency landing. An inspiring speaker, Dave also gave a special presentation for HackensackUMC Palisades employees about his experiences and life lessons learned. Dave was the last passenger off the "Miracle on the Hudson" flight. Dave and many other passengers were treated at HackensackUMC Palisades following the emergency landing in the Hudson River. Click here to see more photos from Dave's presentation. Thanks to the generous support of our sponsors and friends, the 2013 Star Stream Ball was our most successful fundraising event ever. The theme, "A Toast to the Gold Coast," was selected in recognition of HackensackUMC Palisades's 35th year at its current waterfront location. Samir R. Amin, MD, was honored for his service as President of the HackensackUMC Palisades Medical Staff. Arthur E. Imperatore, Sr., was honored for his role in selecting HackensackUMC Palisades's waterfront site and his continued leadership in the development of the Gold Coast. More than 400 people attended the gala held on Saturday, November 23, at the Venetian in Garfield. 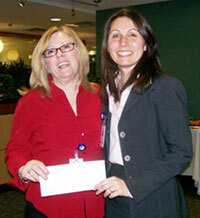 Proceeds from the event help to support the floor-to-ceiling renovations of HackensackUMC Palisades's patient rooms. Click here to see more photos from the 2013 Star Stream Ball. On August 15, 2013, the HackensackUMC Palisades Auxiliary volunteers held their 7th Annual Casino Night fundraiser to support the HackensackUMC Palisades Foundation. The event was held at The Waterside Restaurant in North Bergen and was sponsored by Benzel Busch, Audi Meadowlands, PNC Wealth Management, MTM Resources, NY Waterway and The Waterside Restaurant. Guests enjoyed playing Blackjack, Texas Hold 'Em, Poker, Craps and Roulette. Click here to see more photos from the 7th Annual Casino Night. The HackensackUMC Palisades Foundation's 23rd Annual Palisades Classic was its most successful ever. The event, which was held on May 20, 2013, at the historic Ridgewood Country Club, generated more than $360,000. More than 180 golfers hit the links and enjoyed the dinner reception. Sodexo was the Presenting Sponsor for the Classic. Other leading sponsors for the event included Hackensack University Medical Center, New York Radiology Alliance, and O'Malley Electric. Click here to see more photos from the 23rd Annual Palisades Classic. During the Volunteer Recognition Luncheon, Margot Harris of North Bergen, NJ, received a special recognition award for her many years of volunteer service at Palisades. Harris has been an active volunteer at HackensackUMC Palisades since 1986. Throughout her time at HackensackUMC Palisades, she has provided much-needed clerical support in HackensackUMC Palisades's Finance Department. Click here to see more photos from the 2013 Volunteer Recognition Luncheon. On December 1, the HackensackUMC Palisades Foundation's 2012 Star Stream Ball shattered all of its previous fundraising and attendance records. The event generated more than $385,000 and united more than 450 attendees to honor Thomas M. Eastwick, President of Eastwick College and the HoHoKus Schools, and Mohamed Lateef, M.D., Distinguished Physician Leader. All proceeds from the Ball will support the expansion and renovation of HackensackUMC Palisades's inpatient Pediatric Unit. The black-tie fundraising gala was held at The Venetian in Garfield, and it paid tribute to "The Magic of the Season." Click here to see more photos from the 2012 Star Stream Ball. Special Thanks To Our 22nd Annual Palisades Classic Sponsors! Special thanks to all of our friends who helped make our 22nd Annual Palisades Classic a huge success — generating a new record $325,000 for HackensackUMC Palisades. Click here to see a complete listing of our Palisades Classic sponsors. The HackensackUMC Palisades Auxiliary's 6th Annual Casino Night united more than 200 local residents for a fun-filled night of gambling, raffle drawings, and plenty of great food and spirits. This year's Casino Night generated nearly $20,000 to support programs and services at HackensackUMC Palisades and The Harborage. Casino Night was held at The Waterside Restaurant in North Bergen and presenting sponsors included Benzel Busch, Audi Meadowlands, MTM Resources, Ambulatory Center for Endoscopy, United Water and New York Waterway. Entertainer Jason Nazzaro added to the Casino-style atmosphere by performing Frank Sinatra classics. Click here to see more photos from the 6th Annual Casino Night. On April 19, 2012, HackensackUMC Palisades celebrated National Volunteer Week by holding a special luncheon at The Waterside in North Bergen to recognize its dedicated volunteers for their tireless efforts. 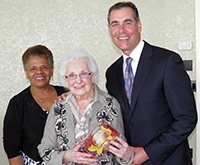 Gladys Leech of Fort Lee, NJ, received a special recognition for her dedicated service at Palisades during the last 12 years. Palisades staff also presented commemorative pins to several volunteers to recognize their cumulative hours of service to the Medical Center. Click here to see more photos from the 2012 Volunteer Recognition Luncheon. On March 10, 2012, the Union City-West New York Rotary Club teamed with HackensackUMC Palisades to present a special Community Health Fair with free health screenings, tests and information available to the general public. 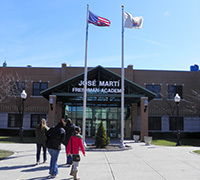 Hundreds of local residents attended the health fair, which was held at the Jose Marti Freshman Academy in Union City. Bi-lingual (English/Spanish) healthcare professionals were on hand to answer questions, and free health screenings and information included blood pressure, cholesterol, diabetes, and many more hospital services. Click here to see more photos from the Union City-West New York Rotary Club Health Fair. On November 19, the HackensackUMC Palisades Foundation's 2011 Star Stream Ball shattered all of its previous fundraising and attendance records. The event generated more than $375,000 and united more than 400 attendees to honor John C. Meditz, Chairman of the Board of Palisades Health System, and Anca Popa, MD, HackensackUMC Palisades Medical Staff President. All proceeds from the Ball will support the expansion and renovation of HackensackUMC Palisades's inpatient Pediatric Unit. The black-tie fundraising gala was held at The Venetian in Garfield, and it paid tribute to the rich musical and artistic cultural heritage of old-world Venice. Click here to see more photos from the 2011 Star Stream Ball. Hundreds of energized guests enjoyed an exciting night at The Waterside Restaurant in North Bergen during the HackensackUMC Palisades Auxiliary's 5th Annual Casino Night to support the HackensackUMC Palisades Foundation. The event generated nearly $20,000 and was generously sponsored by Benzel Busch, MTM Resources, North Jersey Laparoscopic Associates, Ambulatory Center for Endoscopy and Angelica Textile Services. Casino Night attendees were treated to a fun-filled night of gambling, raffle drawings, and plenty of great food and spirits. 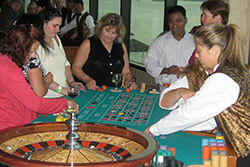 Table games included Blackjack, Texas Hold 'Em, Poker, Craps, Roulette and the Money Wheel. Entertainer Jason Nazzaro added to the Casino-style atmosphere by performing Frank Sinatra classics. Click here to see more photos from the 5th Annual Casino Night. The HackensackUMC Palisades Foundation's fundraising efforts were taken to a whole new level during the 21st Annual Palisades Classic. 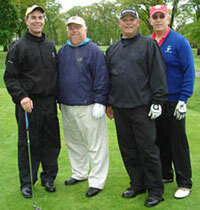 The event, which was held on May 23, 2011, at the historic Ridgewood Country Club, generated more than $320,000. More than 170 golfers hit the links and an additional 55 guests attended the dinner reception. Sodexo was the Presenting Sponsor for the Classic. Ace Sponsors for the event included Siemens Medical Solutions USA, Qualcare Inc., and Duke Realty. Click here to see more photos from the 21st Annual Palisades Classic. On April 29, 2011, HackensackUMC Palisades celebrated National Volunteer Week by holding a special luncheon at The Waterside in North Bergen to recognize its dedicated volunteers for their tireless efforts. Beatriz "Bea" Garcia of Edgewater, NJ, received a special recognition award for serving nearly 15,000 volunteer hours at HackensackUMC Palisades during the last 15 years. Palisades staff also presented commemorative pins to several volunteers to recognize their cumulative hours of service to the Medical Center. Click here to see more photos from the 2011 Volunteer Recognition Luncheon. 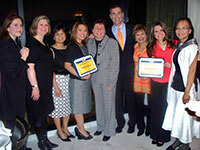 The New Jersey Hospital Association (NJHA) recognized HackensackUMC Palisades's Faith-Based Community Outreach Initiative with its 2011 Community Outreach Award for the program's positive impact in our local communities. The NJHA reviewed applications from 34 hospitals throughout the state before selecting Palisades to receive this award. The Faith-Based Community Outreach Initiative takes a unique approach, breaking down service barriers for individuals and families that have ignored their healthcare needs because of economic, social and language barriers. The program works throughout the year in Palisades' service area of more than 400,000 residents to bring free healthcare education, screening and affordable treatment referrals to local families within their places of worship. Medical students at HackensackUMC Palisades collected and donated more than 140 pairs of blue jeans for homeless teens to support Jeans for Teens, a nationwide program sponsored by Aéropostale and DoSomething.org. The Touro College of Osteopathic Medicine students delivered the donation of jeans to Aéropostale and representatives from DoSomething.org distributed the donation to local homeless shelters and other charities. According to DoSomething.org, 1 in 3 Homeless people in the United States is under the age of 18. Thanks to generous grant support from Seton Hall University's Education and Research Partnership Program, The Aetna Foundation and The Oritani Bank Charitable Foundation, HackensackUMC Palisades conducts a weekly Post-Rehabilitation Stroke Support Group to help improve the lives of stroke and neurological/brain injury patients. Support group participants discuss their experiences and share tips on solving challenges. In the United States, more than 700,000 people suffer a stroke each year, and approximately two-thirds of these individuals survive and require rehabilitation. Dozens of school children in Union City and West New York are now equipped with their own dictionaries to support their studies and help improve their language arts skills thanks to a generous donation from HackensackUMC Palisades to support the Union City-West New York Rotary Club's Dictionaries for Local Kids Program. Students at Cliffside Park High School got into the spirit of giving this holiday season by organizing a special toy drive for to pediatric patients at HackensackUMC Palisades. On November 23, 2010, the HackensackUMC Palisades Foundation presented its prestigious Star Stream Awards to Jeffrey Welz, President of the Weehawken Volunteer First Aid Squad, and Alfredo Z. Matos, Vice President, Renewables and Energy Solutions of PSE&G, for their tireless work in supporting the health and well being of residents throughout Hudson and southern Bergen Counties. The awards were presented to Welz and Matos during the 2010 Star Stream Ball in front of nearly 400 business leaders, public officials and local residents who were in attendance. The black-tie fundraising gala was held at the beautiful Pleasantdale Chateau in West Orange, NJ, and featured a "Hollywood theme" with lively music and dancing, great food, interactive entertainers, and fantastic lighting and décor. The 2010 Star Stream Ball set a new fundraising record for the HackensackUMC Palisades Foundation — generating more than $300,000 to support programs and services at HackensackUMC Palisades. Key sponsors for the Ball included Eastwick College and the HoHoKus Schools, The Harborage, TD Bank and Verizon. Lely Eastwick, Corporate Director of Eastwick College and the HoHoKus Schools, served as Chair of the 2010 Star Stream Ball Committee. Click here to see more photos from the 2010 Star Stream Ball. 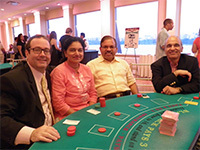 On August 12, 2010, hundreds of local residents helped transform The Waterside Restaurant in North Bergen into a Las Vegas-style casino during HackensackUMC Palisades's 4th Annual Casino Night. The special fundraising event generated nearly $20,000 to support the HackensackUMC Palisades Foundation. Benzel Busch and MTM Resources were the Presenting Sponsors for Casino Night, which was organized by the HackensackUMC Palisades Auxiliary team of dedicated volunteers that works throughout the year to develop fundraising activities. Attendees at the 4th Annual Casino Night enjoyed an exciting night of gambling, raffle drawings, a silent auction and plenty of great food and spirits. 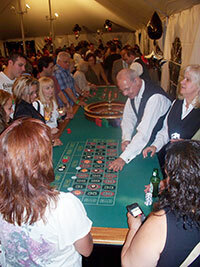 Casino Night table games included Blackjack, Texas Hold 'Em, Poker, Craps, Roulette and the Money Wheel. Entertainer Jason Nazzaro added to the Casino-style atmosphere by performing Frank Sinatra classics. Dozens of lucky winners went home with great raffle and silent auction prizes, including a private wine & cheese tasting party donated & hosted by Giannone Wine & Liquor Co., an attractive women's bracelet donated by Palace Diamond Center, and gift certificates to local restaurants and retail stores. The event ended with the drawing of a Super 50-50 raffle for $5,000, which was won by James Cerefice of Bloomfield. Click here to see more photos from the 4th Annual Casino Night. The 20th Annual Palisades Classic was – by far – the HackensackUMC Palisades Foundation's most-successful golf and tennis event ever. The event brought together nearly 200 supporters and generated $270,000. Sodexo was the Presenting Sponsor for the Classic, which was held at the historic Ridgewood Country Club in Paramus. Masters and Ace Sponsors for the event included Siemens Medical Solutions USA, Qualcare Inc., and Verizon. Click here to see more photos from the 20th Annual Palisades Classic. On April 23, 2010, HackensackUMC Palisades celebrated National Volunteer Week by holding a special luncheon at The Waterside to recognize the tireless efforts of its dedicated volunteers. During the Volunteer Luncheon, Bruce J. Markowitz, President & CEO of HackensackUMC Palisades, presented commemorative pins to local volunteers to recognize their cumulative hours of service to the Medical Center. Volunteers honored with service pins included Beatriz Garcia, Pearl Reis, Margot Harris, Eronidez Cristofol, Paul DeSavino, Gladys Leech, Carmen Rodriguez, Theresa McCann, Cathy Scharaldi, Pearl Sodosky, Dorothy Riley, Ann Marano, Linda McCann, Joan Bacon, Antoinette DePalma, Marie Theresa Giusto, Edelma Acosta, Charles Kim, Lorraine Moretto, Stacey Palos, Lisseth Romero, Sahar Almeshni, Elspeth Cisneros, Seneida Gomez, Jessica Oquendo, Luisa Rivas, Sara Roman, and Jane Vega. Click here to see more photos from the 2010 Volunteer Recognition Luncheon. Each year, HackensackUMC Palisades commemorates Doctors Day with a special celebration to honor the tireless efforts of physicians who work to improve the health and well being of our neighbors. 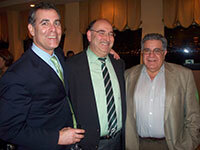 This year's dinner event was held on March 17 at The Waterside in North Bergen. Nearly 200 attendees enjoyed great food, dancing and spirits throughout the evening. Click here to see more photos from the 2010 Physicians Recognition Dinner. Palisades' patients often express their gratitude for the excellent care they received in a variety of ways — through kind words, smiles, letters of thanks, and financial contributions. 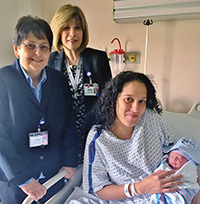 One of the most meaningful ways they express their appreciation is by making a Guardian Angel tribute donation to the HackensackUMC Palisades Foundation's Guardian Angel Program. On March 4, a special reception was held at The Waterside restaurant to honor HackensackUMC Palisades staff who were recognized by patients with tribute donations during the past year. Click here to see more photos from the Guardian Angel Reception. On Halloween Night, more than 350 supporters of the HackensackUMC Palisades Foundation enjoyed an exciting black-tie masquerade ball at the beautiful Pleasantdale Chateau in West Orange that featured lively music and dancing, great food, interactive entertainers, and fantastic lighting and décor. The 2009 Star Stream Ball, which was chaired by Lely Eastwick of Eastwick Colleges, helped raise more than $270,000 to support HackensackUMC Palisades and the Harborage. Attendees included public officials, business and community leaders, and residents from throughout New Jersey. Mark S. Gabelman, MD, and Antonio Ibarria, Sr., were honored during the event with Star Stream Awards for their tireless work in supporting the health and well being of local residents. Miracle on the Hudson flight survivor Dave Sanderson was the event's featured speaker and he praised HackensackUMC Palisades and our community's emergency responders for their work in saving lives. Click here to see more photos from the 2009 Star Stream Ball. Palisades Scores Big In State Report! The Hospital Performance Report 2009, which examines 2008 data from 72 hospitals across the state, ranks the North Bergen hospital in the top 10 percent of New Jersey hospitals in three out of four categories for quality of care. But the report also shows that three Hudson County hospitals – the Bayonne Medical Center, the Hoboken University Medical Center, and Christ Hospital in Jersey City – ranked in the bottom half of hospitals across the state in the four categories investigated. This sixth annual report measures the percentage of patients that received appropriate treatment heart attacks, pneumonia, heart failure and surgical care. HackensackUMC Palisades scored perfect 100s for its treatment of heart attack and heart failure patients. It scored in the top 10 percent of state hospitals for surgical care. "We have consistently had strong and high grades," said Bruce J. Markowitz, president and CEO of HackensackUMC Palisades. "We continue to show improvement in all areas, and thanks to the quality and efforts of all our staff here." HackensackUMC Palisades's strongest supporters enjoyed an exciting night of gambling during the 3rd Annual Casino Night. The event, which was held at Frank's Waterside in North Bergen, raised more than $17,000 for the HackensackUMC Palisades Foundation. The tireless efforts of our Auxiliary volunteers and generous support from our presenting sponsors Thomas Heagney and Frank's Waterside helped make this year's Casino Night a great success. Casino Night attendees enjoyed a lively outdoor reception on the Hudson River waterfront featuring Jason Nazzaro singing Frank Sinatra classics. Following the reception, attendees moved inside Frank's Waterside restaurant where they tested their skills in Blackjack, Texas Hold 'Em, Poker, Craps, and Roulette. The evening also featured a basket raffle, silent auction items and a Super 50-50 Raffle. Click here to see more photos from the 3rd Annual Casino Night. U.S. Airways Flight 1549 passengers Dave Sanderson and Barry Leonard organized and sponsored a very special thank you luncheon and press conference to recognize emergency responders in North Hudson County, New Jersey, who played a vital role during the 'Miracle on the Hudson.' 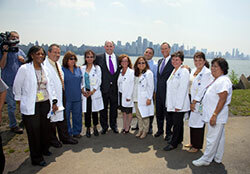 The press conference luncheon was held on HackensackUMC Palisades's outdoor patio, which is located directly on the Hudson River waterfront and less than one mile north of where the Flight 1549 made its water landing on January 15, 2009. Mr. Sanderson and Mr. Leonard enjoyed spending time with representatives from HackensackUMC Palisades, New York Waterway, American Red Cross, Guttenberg Police Department, North Bergen Emergency Medical Services, North Hudson Regional Fire & Rescue, Union City Emergency Medical Services, Weehawken Police Department, Weehawken Volunteer First Aid, West New York Emergency Medical Services, and several other service organizations. Click here to see more photos from the Miracle on the Hudson Thank You Luncheon. May 11, 2009, was a perfect day for more than 160 HackensackUMC Palisades Foundation supporters who gathered at the Ridgewood Country Club in Paramus during the 19th Annual Palisades Classic Golf & Tennis Tournament. More than 120 golfers hit the links, 16 tennis players put their racket skills to the test, and dozens more came to enjoy the evening reception. Ace Sponsors for the event included Qualcare Inc., Siemens Medical Solutions USA and Verizon. Click here to see more photos from the 19th Annual Palisades Classic. January 15, 2009, was anything but an ordinary day along the Hudson River waterfront. Just minutes after takeoff from LaGuardia Airport, US Airways Flight 1549 was forced to make an emergency landing in the Hudson River near Port Imperial in Weehawken, approximately one mile south of HackensackUMC Palisades. The crash landing was coined "The Miracle on the Hudson" by New York Governor David Paterson because all 150 passengers and five crew members on board survived and were safely rescued from the partially submerged plane by nearby watercraft. Several of the plane's passengers were rushed to Palisades for emergency care and were treated for hypothermia and other injuries. The Medical Center staff response was a well-coordinated effort thanks to its extensive disaster relief training and procedures. New Jersey Governor Jon Corzine visited Palisades just hours after the crash to check on the passengers who were being treated in the Emergency Department. 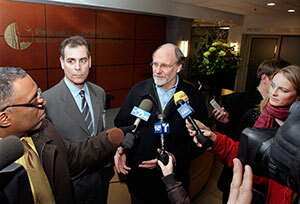 During his visit, Governor Corzine commended Medical Center personnel for their efforts during the crisis. He also acknowledged the heroic efforts of New York Waterway's ferry workers and local fire and rescue personnel. For several days following the crash, passengers who were treated at Palisades were featured on national television news programs including ABC's Good Morning America and CBS's The Morning Show. During their interviews, they consistently praised Palisades' staff for providing high-quality and compassionate care throughout their stay. A generous $10,000 grant from Verizon is helping HackensackUMC Palisades continue to be one of the safest hospitals in the region for patients and Medical Staff. Verizon's philanthropic support has helped Palisades become the only hospital in Hudson County to install the new Medication Administration Check (MAK), a new state-of-the-art computerized system that features barcode technology, like the kind you would find in the checkout lines of grocery stories, to disperse prescription medication. The MAK system correctly matches patients against their mediation orders, creates a record of when medications are given and raises "red flags" when there are potential problems. It features bar-coded patient wristbands, bar-coded medications, new medicine carts and laptop computers in nursing, pharmacy and respiratory therapy. The U.S. Department of Health and Human Services' Health Resources and Services Administration (HRSA) recently awarded a $260,685 grant to Palisades for equipment and technology enhancements that will expand its Operating Rooms and Same Day Surgery Department. This critical expansion will greatly improve capacity and ensure that more than 13,000 more residents will be served at Palisades without leaving our local community to find needed services. It will also help ensure that Palisades is better prepared in the event of a homeland security issue in Manhattan. The HackensackUMC Palisades Foundation was one of only five non-profits to be featured during the Women United in Philanthropy's (WUIP) 4th Annual Fall Gathering. Several HackensackUMC Palisades Foundation and Medical Center staff members were in attendance to discuss Palisades' community outreach activities in southern Bergen County. Erin Brockovich delivered an inspiring keynote address that encouraged attendees to use their collective power to effect positive change in our local communities. Hundreds of business leaders, public officials and local residents filled the Hyatt Regency on the Hudson in Jersey City during HackensackUMC Palisades's 2008 Star Stream Ball. The black-tie event celebrated HackensackUMC Palisades's 30th Anniversary and honored Congressman Albio Sires and HackensackUMC Palisades Chairman Howard M. Shiffman. 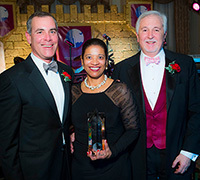 Lely Eastwick, Corporate Director at Eastwick Colleges, served as Chair of the 2008 Star Stream Ball Committee. The event raised more than $250,000 to support the HackensackUMC Palisades Foundation. Key sponsors for the 2008 Star Stream Ball included the Ambulatory Center for Endoscopy, Frank's Waterside, Horizon Asset Management, PSE&G, Siemens Medical Solutions USA, and United Water. Click here to see more photos from the 2008 Star Stream Ball. Local women learned about the importance of early detection through regular breast screenings during Palisades' Breast Cancer Education Seminar. The seminar, which was funded by Susan G. Komen for the Cure — North Jersey, served as a perfect venue for attendees to interact with medical professionals and ask questions to alleviate the anxiety that often accompanies hospital tests and procedures. The seminar also served as the public launch of Palisades' Breast Cancer Community Outreach Program that is working to provide a full circle of breast cancer education and care to our area's uninsured and underinsured women. Program partners include the Cancer Education and Early Detection (CEED) Programs in Hudson County and Bergen County and grant funding was provided by the Komen North Jersey Affiliate. Eligible participants selected by the CEED programs receive free educational materials, initial breast exams, and mammograms at Palisades. The program also offers transportation services and a bi-lingual case manager. The HackensackUMC Palisades Auxiliary's 2nd Annual Casino Night on the Waterfront was a HUGE SUCCESS – generating more than $10,000 to support the HackensackUMC Palisades Foundation! More than 220 attendees enjoyed a fabulous all-night reception while they tried their luck at Blackjack, Texas Hold 'Em, Poker, Craps and Roulette. Raffle prizes were awarded and the event's BIG 50-50 RAFFLE winner ($5,400) was Joe Lazicki, Director of HackensackUMC Palisades's Physical Plant. Casino Night was presented by the Ambulatory Center for Endoscopy & Colonoscopy, Lorenzo Food Group, Inc., and Palermo's Pastry Shop. Click here to see more photos from the 2nd Annual Casino Night on the Waterfront. The HackensackUMC Palisades Foundation's 30th Anniversary Campaign was publicly launched in November 2007, and over 800 local residents, businesses, physicians and Palisades employees have already pledged more than $4.8 million to support the future growth of the Medical Center and the Harborage. On May 20, more than 50 loyal donors attended a special reception at Palisades for the unveiling of the Foundation's new Donor Recognition Wall. Click here to see more photos from the Donor Wall Reception. HackensackUMC Palisades Foundation Chairman John C. Meditz was named the Outstanding Philanthropist of the Year by the Association of Fundraising Professionals (AFP) - New Jersey Chapter. Meditz is widely recognized as the driving force that helped establish the Foundation in 1999. and he recently made a bold statement about his strong support for the Medical Center when he made a personal pledge of $1 million to support the 30th Anniversary Campaign. To commemorate Doctors Day, many supporters of the HackensackUMC Palisades Foundation chose to make special tribute donations to honor their favorite physicians. 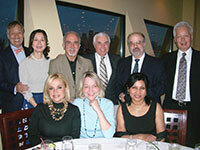 Palisades also celebrated Doctors' Day with a lively reception at Frank's Waterside in North Bergen. More than 80 doctors and their family members enjoyed great food, dancing and spirits throughout the night. Click here to see more photos from the Physicians Recognition Dinner. 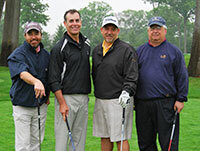 The dreary weather could not dampen the spirits of the more than 100 golfers who hit the links at Ridgewood Country Club in Paramus to support the HackensackUMC Palisades Foundation. The 18th Annual Palisades Classic, which was presented by Sodexho Corporation, turned out to be the Medical Center's most successful golf event ever – generating more than $140,000 in net proceeds. The day of golf at one of the top 100 courses in the nation was followed by a lavish, but casual, cocktail and dinner reception. On May 2, HackensackUMC Palisades celebrated National Volunteer Week by holding a special luncheon at Frank's Waterside to recognize the tireless efforts of its dedicated volunteers. 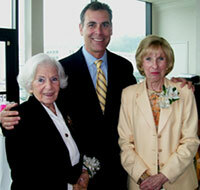 In 2007, volunteers provided more than 22,000 hours of service at Palisades. That equates to more than $500,000 in service value, according to the State of New Jersey. Volunteers also helped raise thousands of dollars for the HackensackUMC Palisades Foundation through the Gift Shop and Auxiliary fundraising activities. 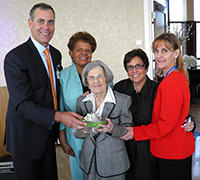 During the Volunteer Luncheon, Bruce J. Markowitz, President & CEO of HackensackUMC Palisades, presented corsages to Pearl Reis of West New York and Joan Venino of Fort Lee for 30 years of volunteer service. Reis and Venino were active volunteers when the Medical Center moved to its North Bergen Waterfront location in 1978. The TD Banknorth Charitable Foundation recently made a generous $50,000 donation that will help improve the health and wellness of low-income residents throughout Hudson and southern Bergen Counties. The contribution will support Palisades' Faith-Based Community Outreach Program that works throughout the year to bring healthcare education, screenings, and affordable treatment referrals to local families within their places of worship. HackensackUMC Palisades has been awarded a $180,000 grant by the Robert Wood Johnson Foundation (RWJF) through its New Jersey Health Initiatives program to participate in a statewide initiative to improve cardiac care to all patients and reduce racial and ethnic health disparities for African American and Latino patients with heart failure. Hudson County's Workforce Investment Board (W.I.B.) 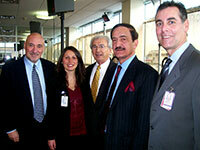 recently held a breakfast meeting at HackensackUMC Palisades's City Lights Café. Attendees learned about the hospital's latest programs and services and were encouraged to support the HackensackUMC Palisades Foundation's 30th Anniversary Campaign. The Hudson County W.I.B. is responsible for the planning, policy guidance, and oversight of the entire workforce development system in our area. The beautiful Pleasantdale Chateau in West Orange served as the perfect setting as the 2007 Star Stream Ball brought together nearly 400 public officials, medical professionals and community members to honor the Founders of Palisades and Medical Staff President Hector L. Florentino, MD. The event also kicked-off a yearlong celebration of HackensackUMC Palisades's 30th Anniversary on the Hudson River waterfront. Attendees were treated to a grand welcome from trumpeters before enjoying an evening of great food and spirits and lively music and dancing. It was an exciting evening on the waterfront as more than 150 people enjoyed HackensackUMC Palisades's first-ever Casino Night. The event featured great food and drinks, and attendees were entertained by magicians as they tested their skills at roulette, blackjack, craps and other Casino games. Many lucky winners walked home with great raffle prizes, including an Atlantic City Getaway (courtesy of PNC Bank in North Bergen), a Sterling Silver Pianegonda Necklace (courtesy of D'amore Jewelers), a Spirit Cruises' Dinner for 4 (courtesy of Sodexho) and a 27" Flat Tube TV (courtesy of Weeks Lerman Distribution, Inc.). The night ended with the drawing of HackensackUMC Palisades's Big 50-50 raffle, which was won by Sharon Doherty, LPN, Assistant PCC at the Harborage. 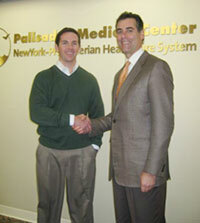 All proceeds from the event supported the HackensackUMC Palisades Foundation. West New York Mayor Sal Vega and hundreds of local families recently spent a fun-filled afternoon on Riverwalk Place during the Grand Opening of the new Ben & Jerry's Scoop Shop. Ice cream lovers of all ages enjoyed the carnival-like atmosphere that featured live music, clowns, mascots, prizes, giveaways and other entertainment. 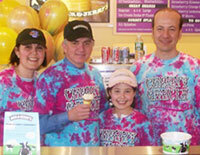 Sibel and Pierre Berberoglu, owners of the new Ben & Jerry's Scoop Shop, organized the special community event and generously donated $200 from the event's proceeds to support the HackensackUMC Palisades Foundation. HackensackUMC Palisades's Auxiliary, a team of dedicated volunteers that works throughout the year to support HackensackUMC Palisades and its patients, recently presented a $15,000 donation to the HackensackUMC Palisades Foundation. The generous donation was the result of several recent fundraising activities organized by the Auxiliary, including raffles, a bake sale, an Under the Stars waterfront event, and a special Night at the Races at the Meadowlands. More than 80 people recently attended a special Wine and Food Tasting at Sabor Latin Bistro in North Bergen to help support the HackensackUMC Palisades Foundation. Attendees were treated to an array of wines from Riverside Wine Merchants and samples of Sabor's continental cuisine spiced to a Latin beat. 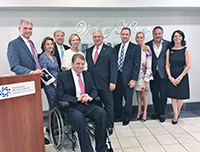 K. Hovnanian Homes, one of the nation's top homebuilders and the largest builder in New Jersey, recently made a powerful commitment to support the needs of residents throughout Hudson and Southern Bergen counties by making a generous $125,000 donation to the HackensackUMC Palisades Foundation. 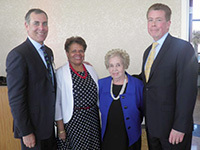 More than 300 business leaders, public officials and local residents recently came together to honor TD Banknorth and Arthur E. Imperatore for their philanthropic support of the HackensackUMC Palisades Foundation. The 2006 Autumn Ball, which was held at the Glenpointe Marriott in Teaneck, NJ, featured a New York theme and included street performers, foods from New York's finest neighborhoods and a Coney Island-style photo booth to make attendees feel like they were truly in "The Big Apple." 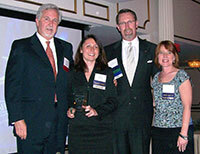 TD Banknorth was honored with HackensackUMC Palisades's 2006 Star Stream Award for its loyal support. 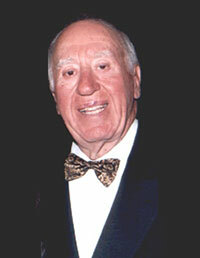 Imperatore also received special honors for his generous philanthropic efforts, and HackensackUMC Palisades established the Arthur E. Imperatore Legacy Society to recognize donors who generously support the HackensackUMC Palisades Foundation well beyond their lifetime through bequests, charitable trusts and gift annuities. Customers at the Barnes & Noble Bookstore in Edgewater purchased and donated new books for children in pediatric care at HackensackUMC Palisades. 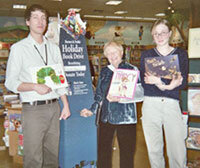 Barnes & Noble's Michael Marmo, Paulette Ulisse, and Neda Rose helped organize and promote the book drive. Arthur E. Imperatore Sr., a resident of Weehawken, recently made a bold statement about his lifelong commitment to our community by generously pledging a $2,000,000 bequest to support the HackensackUMC Palisades Foundation in North Bergen, New Jersey. 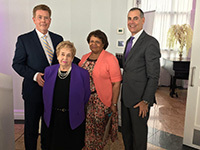 The bequest will help build the endowment to support the programmatic and capital needs of HackensackUMC Palisades and the Harborage to ensure the continued creation and improvement of new healthcare services, facilities and medical technologies. Dozens of local residents recently took a trip to the Meadowlands Racetrack for a special fundraising activity to support the HackensackUMC Palisades Foundation. A Night at the Races was organized by HackensackUMC Palisades's Auxiliary, a team of dedicated volunteers that work throughout the year to support the hospital and its patients.